There's nothing like Western Hospitality especially during the most festive time of the year - Christmas Time! This collection includes shows from a wide selection of the western genre from music to variety to historical drama. Allow yourself to be taken back to Christmas in the western frontier with Dr. Six Gun, Gunsmoke, and Six Shooter . Dr. Six Gun's Christmas special featured a heartwarming story about a boy with a frozen foot Tomasito Munoz who wants a pony for Christmas. In Gunsmoke, can the power of Christmas and Matt Dillion stop a family feud when a man walks up from the Ozarks by foot to kill a family rival? 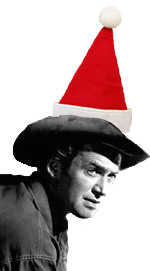 Our favorite show in the Western Christmas Collection is with Jimmy Stewart in Six Shooter telling a western version of a Christmas Carol. Variety western show All Star Western Theater presents a unique version of the Nativity story with three cowboys heading to a revival meeting. Melody Ranch has all your favorite Christmas Carols with a fun western swing in Christmas Party. 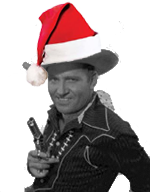 Get yer tin star on top of the Christmas Tree and yer fiddle to twang some carols, because it's Christmas Time in the wild west. Be the first to comment on "Western Christmas"